Best Camping Hammock 2019: If you have been on our site for a while, you know that we are all about finding and suggesting the best ways to travel light. Lightweight backpacking is the way to go for most people who don’t prefer to lug around a lot of weight when they are traveling on foot. But most times you may find yourself faced with a serious problem: lightweight backpacking can often end up being too much of a load on your pockets due to the sophisticated materials and construction used in manufacturing them. This obviously does not work out well for campers who look for the best means to travel on a budget. Moreover, we feel like it kind of defeats the whole purpose of backpacking. To rectify this situation, we have found ourselves our latest camping obsession: the best camping hammock for you can make all the difference. In this post, we talk about why you need to ditch the weight and associated headache by opting for hammock camping as opposed to the more traditional tents. And as always, we have presented you with the best camping hammocks 2019 selections and reviews that might just make your next trip all the more convenient. And interesting. We begin our best camping hammock reviews in no particular order. Note that we have considered all the factors (refer our buying guides at the bottom of this article) for the benefit of the buyer, so all you have to do is just take your pick. 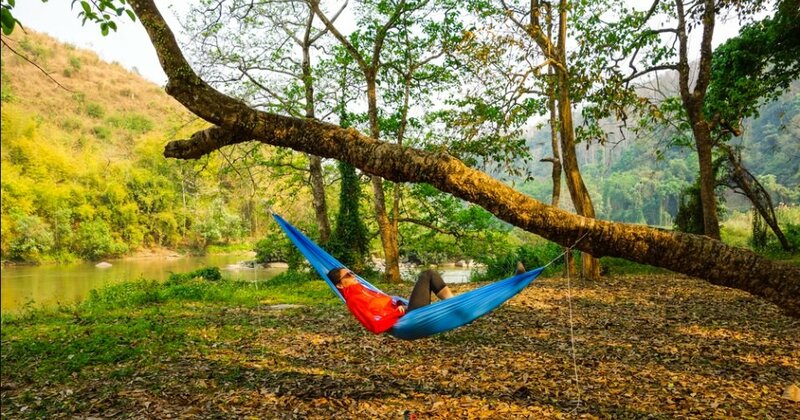 Feel free to go through this list of probably 10 best camping hammocks 2019 which you can buy right now. Let’s get started!! One of the most popular reasons to opt for a camping hammock is budget backpacking, and we kick off our list of the best camping hammocks for 2019 with what can be easily be named as the best hammock for camping on a budget. However, it would be a mistake to identify its pocket-friendly price with poor quality. The Active Roots camping hammock is made of durable parachute nylon that can hold up to 500 pounds of weight, while most standard models come with up to 300 pounds of holding capacity. The company describes it as a double holder, which means that you can choose to lounge around on your own or snuggle in with someone. The Active Roots camping hammock is the best one you can get your hands on for lightweight backpacking as the product weighs in at only 2 lbs. It scores high in terms of packability as well: it comes with an attached sack that hangs down the side of the product when in use (so you don’t have to worry about losing it), and the whole thing can easily be stashed away in one part of your hiking backpack. The best part is the safe and easy setup, thanks to the great quality gear that it comes with including carabiners and straps for the most secure fastening. You will not find yourself on the ground once you’re snuggled inside one of these. 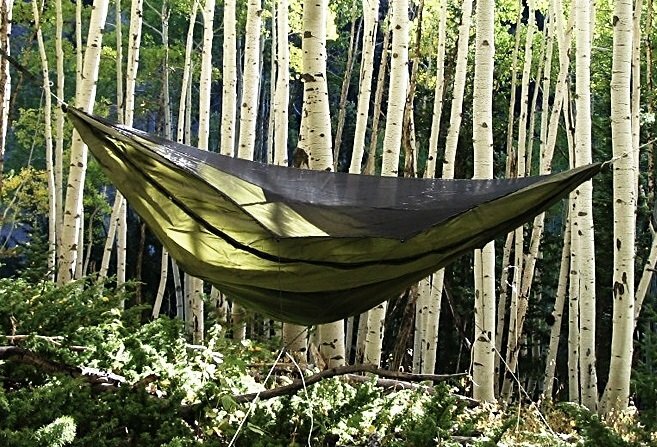 The Active Roots Camping Hammock has more to it than just an attractive price. If you like a lot of space for yourself, you can easily go for this one. It’s also great for a diagonal lay, which many hammock campers find more convenient. If you can’t be bothered about complicated setups, go for this one with your eyes closed. In short, it deserves a spot on this list of best hammocks 2019. AS DURABLE AS THEY COME - our double camping hammock supports up to 500 pounds, meaning you can spaciously lounge alone, with that special someone, or with dozens of puppies. Think about it: you, puppies, a hammock. Life doesn't get any better. HIGHEST QUALITY GEAR - our camping hammocks come with the best accessories, including the highest quality carabiners and hammock tree straps. We're giving you the Ferrari of hammock equipment. Trust us, it makes a difference. 100% MONEY BACK GUARANTEE - want to know how confident we are? Consider this a trial. If you don't like this parachute hammock, send it back and receive your money back. Your support is what makes us keep going, so we want you to be completely satisfied with your hammock. If you aren't, neither are we. SUPPORT A GREAT CAUSE: 5% of each sale is donated to the Elephant Conservation Center in Laos. This incredible organization is dedicated to protecting and rehabilitating the endangered Asian elephant population through various programs. By purchasing a camping hammock and supporting us, you support them too...help us save the elephants! 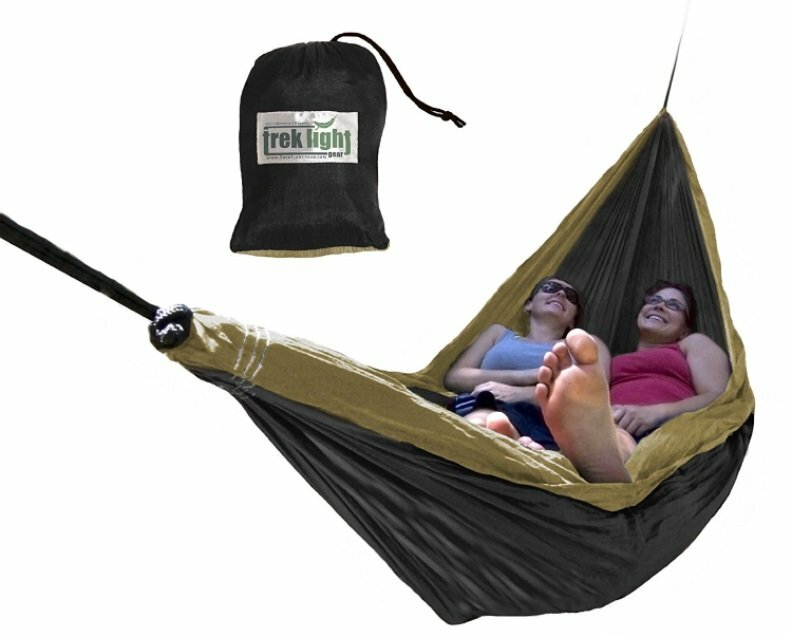 Another great option for the space-loving camper, the Trek Light Gear Double Hammock is another durable nylon offering that refuses to fail in terms of comfort. Really the whole package. The company claims that it is the largest option available in the market from any of the best camping hammock brands, and thanks to its 10′ / 6.5′ construction, we are not in a hurry to argue with them. This also makes it the perfect companion to lounge around all day in, for there is ample space to roll around. The reinforced nylon material makes it one of the most durable and quick drying options on offer, and the three-year manufacturer’s warranty does no harm. The best part, however, is how amazingly lightweight and portable it really is. Compared to the Active Roots model listed above, the Trek Light model weighs a little over a measly 1 lb. It also packs in really small, making it a backpacker’s true delight. In addition to that, it can hold up to 400 pounds of weight, meaning it serves perfectly well for accommodating two large people inside. The material of this backpacking hammock comes with anti-rot and mildew protection, making it a great option for sleeping outdoors in both hot and wet climes. The breathable material means you will also be well protected from the summer heat, and if you do get sweaty, your hammock’s moisture-shedding abilities won’t hold it against you. The Trek Light Gear Double Hammock is not just a great camping equipment, but it also works great for those looking to get better sleep. In fact, many reviewers are of the opinion that their sleep quality has improved remarkably since they started sleeping in one of these. If insomnia is not your concern, but a comfortable camping trip is, then too this is one of the best camping hammocks to go for. Our only complaint is that at this price, we expect to set up materials to come included, as there are other best budget hammocks which have an edge over this on this particular matter. BEST-SELLING HAMMOCK - The most comfortable, extra-wide hammock we make! This popular ultralight hammock] is a must-have for camping gear or outdoor gear collections, tailgating, days at the park, or even for sleeping at home. OVERSIZED - We call it the "Double," but that doesn't mean you need a friend to use it - measuring at 6.5' wide and 10' long, this hammock is larger than any other Double Hammock on the market. You can stretch out horizontally,at an angle to lie perfectly flat, share it with a friend or use the extra room to wrap up in it camping. GREAT FOR CAMPING - The Double Hammock holds up to 400 lbs and only weighs slightly over 1 lb (20 oz) in the pouch. Way smaller and less bulky than any tent (or even camping chair!) on the market! Plus, it's quick and easy to set up - be sure to check out our helpful, hanging kits! DURABLE, DRY & COLORFUL - Our Hammocks are lightweight, quick drying, durable and breathable. Choose from a wide variety of colors! They all come with a 3-YEAR MANUFACTURER'S WARRANTY - longer than any of the competition! THE TRUSTED BRAND - Don't be fooled by imitators on Amazon - Trek Light Gear is the original brand you can trust. As the lightweight hammock pioneer since 2003, we make customer happiness our #1 priority and we plant a tree for every hammock we sell. A season rating is as important in a camping hammock as it is in a camping tent, and the Clark NX-270 Four Season Camping Hammock is one of the best products you will find for all weathers. Do note that at nearly $500, it is not for those campers looking for cheap camping hammocks or alternative for tents. However, the kind of features it comes with definitely justify its high price tag. So if budget is not a cause of concern and you are looking to buy a particularly feature-rich model, then you may take a look at this one. The Clark NX-270 Four Season Camping Hammock makes for a rare find for anyone who is not averse to the idea of hammock camping even in snowy weathers. In fact, this one is more of a camping hammocks tent rather just a hammock. It comes with a large rainfly which stretches far enough to bring all your additional gear underneath to keep them protected from the weather. The entire material is waterproof, including the ropes, meaning they don’t absorb water at all. This translates to a very good night’s sleep even in the pouring rain. It will keep you completely dry. Being a camping hammock tent, you can expect a bit more weight for the capacity. It weighs a little over 2 lbs and can hold up to 300 pounds. This suffices as a single person tent, so you shouldn’t really try to bring in an extra person. Set up also takes a fair amount of time, although that is, once again, to be expected. 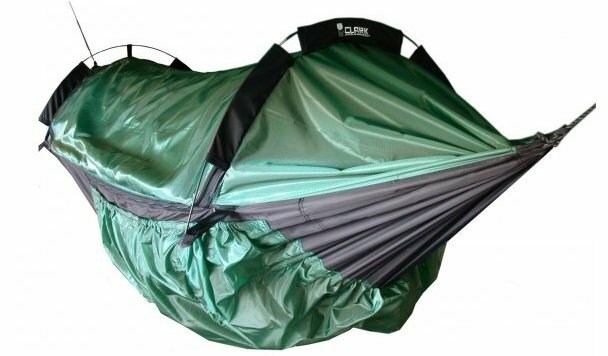 Many people will not find the terms “backpacking” and “luxury” being used in the same breath, but the Clark NX-270 Four Season Camping Hammock brings the two extremes together. This feature rich hammock tent is the luxurious backpacker’s dream, and its protections and functionality remain unparalleled. If you have the money to spare, go for it. 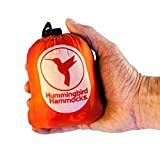 If ultralight hammock camping on a budget is your thing, look no further than the Hummingbird Hammocks Ultralight Single Plus Hammock. Weighing in at a measly 7.6 ounces, this is the unit to go for if you are looking to shed as much weight from your backpack as possible. As a single sized camping hammock, this is a great performer. The ultralight and very durable parachute rigger construction make it one of the toughest hammocks that you can find the confidence to take anywhere. The Plus model is a little larger than the standard single Hummingbird model, adding an extra 12 inches in length and 14 inches in width, making it a great option for anyone with a larger build or someone who just likes having their own space to themselves. To that end, it also supports more weight capacity and can hold up to 350 pounds. The manufacturer has also found some great ways to shave off extra weight by getting rid of heavy attachment gear, and this unit comes with a button link attachment that is devoid of any metal parts. It also packs is very, very small, and no amount of abuse has seen a single stitch coming out of place. It is surely one of the best ultralight hammocks that are available in the market. The Hummingbird Hammocks Ultralight Single Plus Hammock is an ultralight backpacker’s delight in every possible way. The only setback that we have pointed out does not present much of an adversity because of the price of the hammock, unlike the Clark NX-270 Four Season Camping Hammock listed above. One of military grade construction, the Kammok Roo Double Camping Hammock attributes its tougher than nails durability to the company’s use of the LunarWave fabric that goes into making it. We have refrained from discussing a hammock’s looks for so far, but the Roo’s brightly colored dual tone design is worth a mention. Coming to the more important bits, this one is one of the most comfortable camping hammocks that you will perhaps be able to find. Weighing in at a comfortable and very packable 23 ounces, it can hold weights up to 500 pounds. So whether you’re traveling with a partner, your pets, or just like to have a ton of space to yourself out in the wilderness, this one is yours for the taking. It also comes with climber grade carabiners for excellent stability, and we also want a moment to appreciate the Kammock Roos’ excellent suspension system. It comes with an included stuff sack, which can hold this ultralight double camping hammock in a very small packed form. You need to buy separate straps for fastening, although the ones from Kammock are of excellent quality that beat all others. Another great plus is the fact that they set up very easily, so you won’t have to struggle. The biggest advantage of this hammock, however, is how amazingly soft it feels, as opposed to most models that feel like they’re stretched too thin. The Kammok Roo Double Camping Hammock is the one that you are bound to get some of the most comfortable snooze time in, and the lifetime warranty makes sure that any manufacturing defects are taken care of. Kammock’s socially conscious stance with the aim to help those in poverty in Kenya is an admirable stand, and every purchase you make will help contribute. So go for it if you want a good night’s sleep, in every way. Comfortable Size: The Roo unfurls to 10'L x 5'7"W, about the size of a queen size bed and comfortably fits two people. Durable & Strong: The Roo has a weight capacity of 500lbs and is made of Kammok's proprietary LunarWave fabric that is stronger, lighter, and softer than other parachute fabrics. It also comes with two climbing rated carabiners (22 kN) and two Dyneema slings for suspension. Portable & Lightweight: The Roo weighs just 23oz (with carabiners packed) and compresses down into its stuff sack at 5.5"L x 6.5"H x 4.5"W, making it ultra portable and an excellent companion for any adventure. Socially Conscious: With every Roo purchased, a portion of your purchase goes toward providing resources to create sustainable change in Kenyan communities through CTC International. Lifetime Warranty: We proudly stand behind everything we make. The Roo carries a lifetime warranty to the original owner against material and workmanship defects. The warranty does not apply to normal wear and tear and requires proof of purchase or warranty registration on the Kammok website. One of the biggest reasons campers and hikers prefer lugging a tent on their backs even if it’s bulky and takes up most of the space inside your gear pack is because of the protection they afford. The full closing feature of a traditional tent lets you keep the bugs out, and that, to many, makes it worth the effort. The Best Camp Hammocks, on the other hand, are traditionally open shelters. But many manufacturers have adopted a bug-free approach with built-in features to keep the irritants away. And even if your hammock doesn’t come with a bug repellent design, you can just buy a net. However, there is another option for those who can’t be bothered with assembly. The Hammock Bliss No-See-Um No More Camping Hammock is a great offering that can rival your tent in terms of outdoor-ready features. 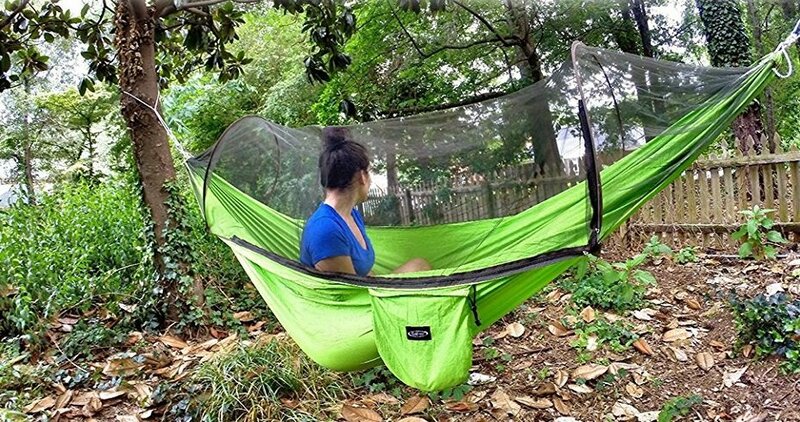 This hammock comes with built-in anti-bug netting that has 2100 Holes Per Square Inch, making the holes so tiny that even the smallest of insects will not be able to get through. The durable netting hangs well above the hammock with the help of extra cords and stays completely attached to the sides of the hammock with sturdy zippers. 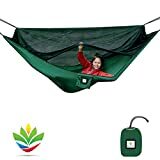 This is one of the best camping hammocks 2019 and with mosquito net, it is very utility-oriented and comes with 4 loops on the inside as well as 4 pockets on the netting to make sure all your gear can be stuffed inside. Staying well protected from the creepy crawlies is a crucial factor when staying outdoors, and the Hammock Bliss No-See-Um No More Camping Hammock is one of the very best outdoor shelters for such a purpose. You may have to work out a more comfortable stay especially when it rains or the temperature dips, but honestly, this comes highly recommended as a summer hammock. If you’re looking for a completely protective hammock set up and are willing to spend more than what you get the Hammock Bliss No-See-Um No More model above, then the Hennessy Expedition may just be the right one for you. This wonderful hammock for camping saves you the time and effort to gather all your hammock camping essentials, which can be a special pain for the beginner. It comes included with a rainfly that is big enough to keep the waters out completely, carabiners and other support equipment to make for the easiest set up (once you’re used to it), and the best part is that the tree straps are designed not to leave any marks on the trees. The Hennessy Expedition Hammock is your best bet for staying warm when you’re windy, although you’ll definitely need an insulated sleeping pad or an under quilt-blanket combination. However, it really is one of the best camping hammocks you will find to spare you most of the headaches associated with buying a new hammock. The hammock itself is made of great quality Oxford nylon which feels comfortable when you’re sleeping in it. This camping hammock with rainfly doesn’t add a whole lot of weight to your backpack, and the whole unit weighs in at around 3 lbs. It can support up to 250 pounds of body weight. If you feel like you are ready to say goodbye to the habit of sleeping in tents, then the Hennessy Hammock Expedition Series Camping Hammock is a hammock campers best friend. 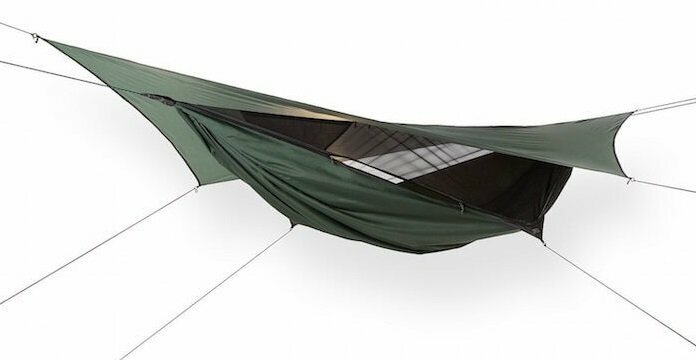 The unit comes with everything that one might need for a great and protective hammock set up, and is big enough to let you sleep in the diagonal as well. The easy set up makes this hammock all the better. EXPEDITION ZIP is our most popular all-around camping hammock, designed for anyone up to 6ft and 250lbs (183cm /114kg); Side entry with #10 YKK Zipper with 2 double sliders; Famous for durability, packability, versatility and comfort. COMPLETE system includes: 70d high density nylon bottom; 30D no-see-um mosquito mesh; Elastic "hold open" for mesh; Gear loft slides on ridgeline; 70d polyester ripstop rain tarp; 1500lb (680kg) test polyester ropes; Complimentary webbing straps included. QUALITY ASSURANCE: One year on materials and workmanship; Weight: 2lb 12oz (1247g); Compact size: 4"x 7"x 9" (10cm x 18cm x 23cm); Color: Hunter Green with black trim; See Enhanced product info at bottom of this page. If you’re looking for The best single-sized camping hammock for the ultimate backpacking experience, then the ENO Eagles Nest Outfitters SingleNest Hammock could be exactly what you are looking for. Not only is this hammock exceptionally large so that you can sleep in it any way that you may like, but it can also hold massive weights. The ENO Eagles Nest Outfitters SingleNest Hammock is one of the best minimalist camping hammocks that you can lay your hands on, and at its price, it’s a proper steal. If you are of the opinion that most minimalist gear is unreliable and poorly constructed to shed weight, you couldn’t be more misguided about the ENO SingleNest. Weighing in at around 1 pound, this single camping hammock supports weights of up to 400 pounds, which is unlike most other units that you will find, especially at the price. This along with the extra room means that you will be able to bring in most of your gear inside instead of having them loitering outside. The construction material (70D High Tenacity Nylon Taffeta) quality is top notch as well, and the company’s attempts at reducing waste are commendable. 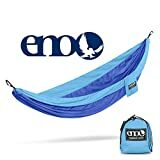 The ENO Eagles Nest Outfitters SingleNest Hammock is one of our favorites for the lightweight backpacker who doesn’t deem compromising on quality to be an option. However, note that its huge capacity does not mean that there’s enough space to hold two people. Also, you may find that your product is different from what you see in the picture. The company attributes this to their commitment to reduce environmental waste, for which they use every bit of the material they have on their hands. So don’t freak out, and enjoy your stay in it. While we are on the topic of super lightweight, minimalist camping hammocks, the Grand Trunk Nano 7 Camping Hammock easily deserves the accolade of being one of the best hammocks tents. It beats the ENO SingleNest model listed above by a few ounces and is the lightest model we have on our list so far. Weighing in at only the slightest bit above 7 lbs, the Grand Trunk Nano 7 is one of the best lightweight camping hammocks that you can find. The construction material is quite durable too and will last you through several trips as long as you don’t go above the 300 pounds capacity. However, note that the Grand Trunk Nano 7 does compromise on the space front (this is one of the many ways they shave off excess weight), so it’s not an ideal hammock to sprawl around in. People around or above 6′ will have trouble fitting into it, and the narrowness of the hammock does not allow for a great diagonal lay for most. However, the 9′ by 4′ construction is great for rain coverage as it fits comfortably under most rainfly tarps. One of the biggest concerns for campers considering lightweight options is durability, but the Nano 7 scores high on that front as well. Another great alternative to the Grand Trunk Nano 7 is the ENO Sub 7 Camping Hammock, which you can also check out if you’re into lightweight backpacking hammock. The Grand Trunk Nano 7 Camping Hammock should be your go-to option if you’re looking to shed as much weight as possible. We especially like the stretchy material, which allows you a reasonable amount of rolling space without feeling constriction. Go for this one if you are under 6′ and prefer weight optimization above all else. Ready to ditch the tent for good? Go for the G4Free Portable and Foldable Camping Hammock that comes complete with an attached mosquito net for the best kind of protection against no see ums. This one falls under that elusive yet very broad category of camping hammock tents and is definitely not for the minimalist. 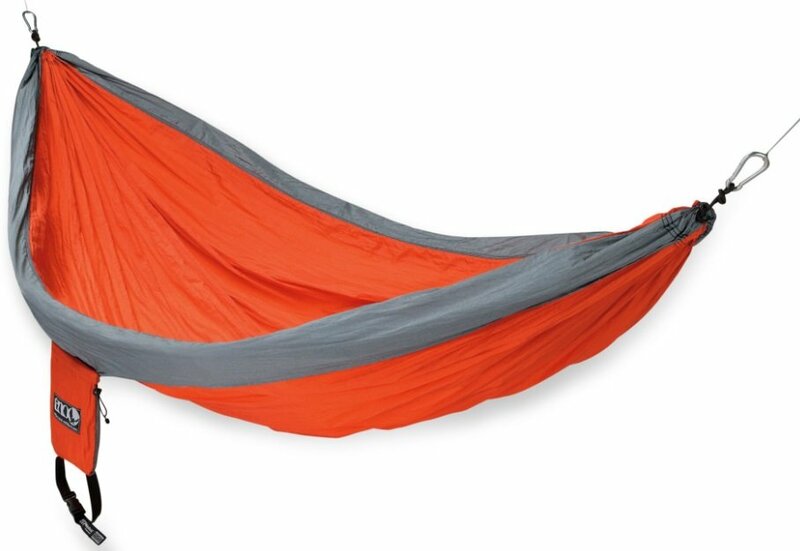 But the G4Free hammock has a number of credits to itself to make it your perfect outdoor companion. Unlike the Hammock Bliss model we have listed above, this one has its protective mesh covering on top hoisted atop the hammock bed in a tunnel-like construction, eliminating the need for you to hang it up in a way so that it doesn’t hang too low. This wonderful set up even allows the occupant to sit up fully straight inside the hammock. The net cannot be detached, but the hammock is fully reversible for when you want to do without the netting. The entire unit weighs around 2 lbs but can support weights of up to 440 pounds. The quick-drying nylon fabric of the hammock is mildew and rot resistant and extremely durable. The other great thing about this camping hammock tent is that it is easy to set up: it only takes a few minutes. It is also very comfortable to sleep in, easy to pack into the small stuff sack (provided you follow the included instructions, and portable. If you’re lucky you may get your hands on this camping hammock for sale. 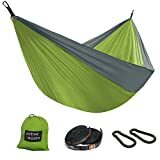 It is surely one of the best backpacking hammocks 2019, and you should have a good look at it. If you are looking for a way to lounge around in your backyard or on a camping trip without the bugs, then you could consider buying the G4Free Portable and Foldable Camping Hammock with Mosquito Net. It’s a great option for petite people, although probably not so much for taller folks (hammock measures around 9’5″ in length). However, comfort and quality are great and the hammock is also very easily portable, making it a possible backpacking option too. We’re all familiar with hammocks. They can be fitted securely between two trees and provide some of the most comfortable ways to lounge around in. And we are sure you have done that during your childhood. But relaxing in a hammock in the summer out in your backyard is a lot easier than going for a full-blown camping trip where you rely solely on a single piece of material (for the most part). And yet we find that hammock camping is becoming more and more popular among seriously lightweight backpackers. If that’s what you wish to find out more about, then we suggest you skip ahead to the section below to see if it fits your interests. However, there is no reason to believe that the use of a hammock must directly imply bidding adieu to your trusty tent. After all, as most campers would know, a tent offers the sturdiest temporary shelters that you can carry along, and they can be found in types to brave all weather conditions- be it rain or shine. But at the same time, one must agree that they can feel rather restrictive, especially if you stay inside in hot or humid weathers. And then there are the rains that can potentially flood the ground you are sleeping on. Needless to say, a lightweight camping hammock can make a great companion to your tent. They don’t take up a ton of space, and they certainly don’t weigh you down by much extra. So the next time you go camping in the summers, take one of these along to see how lounging around under the stars feels. In addition to the open air being far more comfortable, they can also be much better for your back. However, they can also make great shelters on their own. Read on below. In short, it is exactly what its name suggests. Although most traditional campers who aren’t familiar with this trend may find the idea a little strange, hammock camping is actually far better suited for certain kinds of trips, as opposed to traditional methods of camping with a tent. First things first, the elimination of associated construction aids that are common in a tent (such as poles, or necessary internal equipment like sleeping bags and pads) makes for a much lighter and less grueling travel on foot. Moreover, if you are a firm believer in the Leave No Trace philosophy that more and more campers are adopting for the benefit of the environment, then hammock camping is the way to go for you. But as is obvious, individual safety and comfort are some of the high-ranking factors when you are expected to lay out alone under the stars, and camping hammocks are particularly good amazing in this field. Due to being suspended shelters that can easily be hung between two trees, hammocks keep you high above the ground, thus making them better at hygiene. There are less creepy crawlies to combat, and no dirt involved. To ward off the mosquitoes and other flying pests, some hammocks come with an integrated netting system. Even if they don’t, the beauty of a camping hammock lies in the way you can customize and create your own space. In case of rainy conditions, you may hang a tarp on top of the shelter to keep the water out. On top of that, a suspended shelter also means that you will not have to rely on suitable ground conditions to set up your shelter in. This means that even if the rains have flooded the grounds, you will stay dry and safe in your hammock with the right kind of set up. Also, you don’t have to worry about being able to set up on a slanting terrain or one that refuses to hold the tent poles up straight. Besides, they are far more interactive. All in all, we recommend camping hammocks over tents for anyone traveling to a temperate zone. The air flow keeps the humidity away, and the suspension is great for you as well as the environment. Just find two strong trees, and camp in comfort. That’s why you must consider buying best camping hammocks 2019 for your needs. Unlike what the inexperienced may think, buying a hammock for camping is not in any way akin to buying a simple length of material to be strung in between trees. Much like the best backpacking tents, they will also serve as your home away from home when you’re on the road. And buying them also requires thorough consideration of factors that will make your stay in them much safer and more comfortable. Here are a few things that you must determine before taking the plunge of buying the best hammock for hiking. Before you buy that coveted hammock that will let you lounge around in style and ease, it is but obvious that you need to consider the kind of climate you expect your destination to have. As you must have guessed already, these will not make the best camping companions when you expect to be surrounded by snow. At least on their own. Camping hammocks are great for hotter climes or wet weather camps. The fabric of your camping hammock can make all the difference in the world. Thankfully, there isn’t much scope to be confused when it comes to this particular factor. From the options available on the market, we would recommend going for the ones in nylon for their reduced weight as well as quick drying properties, which makes them a natural choice for humid/ wet climates. There is much more than just the fabric when it comes to determining the weight of your hammock. One of the primary purposes of hammock camping is to shed as much weight as possible, so it is but natural that you should try to keep it as simple as possible. Apparently minor factors, such as stitching, can have an influence on how much these may weigh. But the most important part is the suspension system, which is what you should really count when you’re looking at how much the hammock weighs. In fact, most of the hiking enthusiasts prefer lightweight camping hammock for their use cases. On the other side of the coin is the factor of your own weight. Being a suspended system, your hammock should be able to support your weight along with some extra things you might want to throw inside (more on that later). You can check for the capacity on the label or ask your store assistant for help with this. On that note, it is better to go for a slightly larger size/ bigger capacity in case the requirements call for it. This is entirely depended on how a hammock hangs, and even the distance between the supports can have an influence on this. The fabric too plays a significant role. If possible, find out what kind of set up works best for you before you head on out. 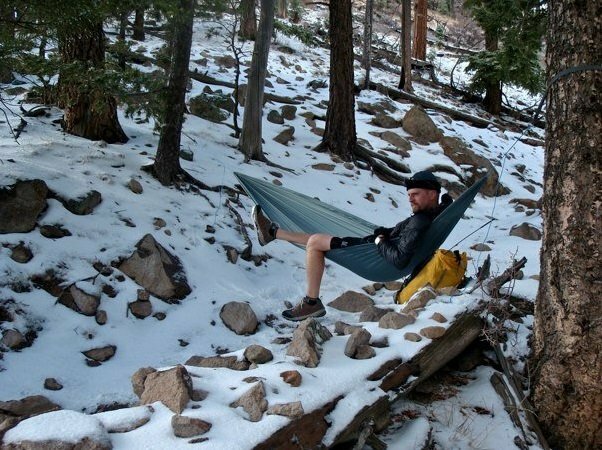 Although hammock camping is mostly a summer favorite among campers, some nights can get chilly. Even more so if it’s a rainy night. There are different kinds of accessories on offer to make the stay inside your hammock more comfortable. This is where you switch your sleeping pad/ bag for an under quilt, which stay better put in their position. If needed, you can throw in a blanket on top. In case you are expecting rains, go for synthetic models that are easier to dry rather than down. We repeat that the best thing about camping hammocks is that they let you customize your stay however you want. Although the best way to get your set up just right is by finding out yourself, it may be wise to invest in a couple of extra accessories such as a mosquito net or a camping hammock with rainfly, as well as some lines to fix them up to keep you well protected from the elements. You can also opt to buy a camping hammock with mosquito net integrated into it. Unless you’re buying a lot of extra equipment, you will not have to shell out a ton of money to get the best hammock. They’re available in all ranges, and the sole purpose is to make it easier on the backpacker’s back and wallet. So don’t you worry about having to dig too deep. Now that you know what the hype is all about, let us move on to the best items you will find on the internet. You can find some of the best camping hammocks on Amazon and we will guide you to explore the best camping hammock 2019 brands with comprehensive reviews. Camping hammocks are easily one of the best ways you can sleep out in the open, and trust us when we say that they provide for some of the best sleep. You don’t have to wake up with stiff joints or body aches, but feel fresh and lively in the morning. We chose the ones listed above based on performance, price, and weight to capacity ratio, and these fared the best in these sections. Another important factor we considered was the ease of set up so that our readers won’t have to scramble with feet of material wondering how best to pitch it between trees. We may have reached the end of our list of the top 10 best camping hammocks 2019 and camping hammock reviews, but if you have a favorite that you want us to check out, do let us know in the comments section.